Agent Nygrens BLOGG! : New download-link with one rar-file that includes the whole mod (readme inside): Scarlet MOD V 2.0 -Play as Scarlet of the Shinra, replacing Aerith in Final Fantasy VII for PC! New download-link with one rar-file that includes the whole mod (readme inside): Scarlet MOD V 2.0 -Play as Scarlet of the Shinra, replacing Aerith in Final Fantasy VII for PC! 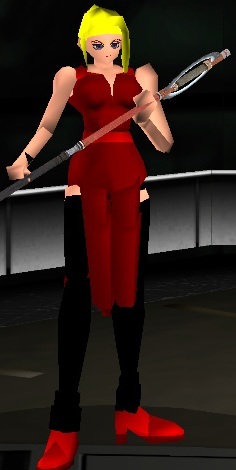 New battle model of Scarlet of the Shinra, replacing Aeriths battle model in the game Final Fantasy VII for PC. I have modified the PRB-versions of the characters using Tifa's Bootleg Mod. Install Tifas Bootleg mod first. 1. Back up your "char.lgp" found in your FF7/data/field folder. Then unpack it using UNLGP and rename that folder "char". You can unrar an lgp-archive by doubleclicking on the lgp-file after you have installed the program unlgp. Put all the field-model files in your new "char"-folder. 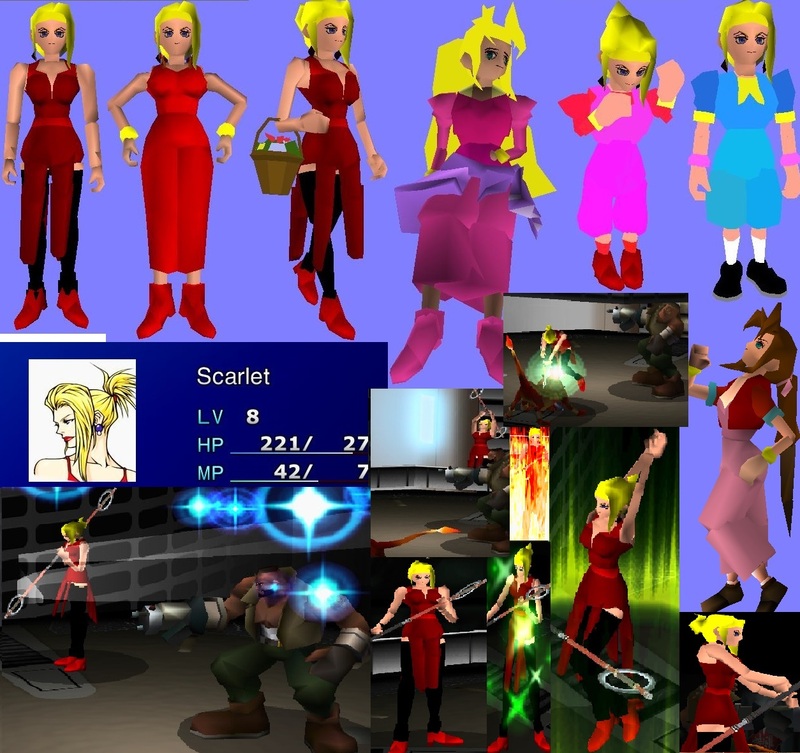 These includes Scarlet 5 years old, Scarlet 10 years old, Scarlet with flowers, Scarlet finished field model, Scarlet in dress files and Evil Aerith who replaces Scarlet as an npc. All versions of Scarlet are now compatible with Aeriths textures. You can play with Evil Aerith now without getting the textures messed up. Just copy and paste all the files including the texture-files into your char-folder. When you have decided who you want to add you should create a new lgp-file. You can do this easy by clicking on "swift" at the same time while you are right-clicking on the folder. Click on "create lgp" as it will be such an option. The file will then be created and you should wait until it finishes. Make sure the file is named char.lgp. Now, if you start your game you will have the field models. 2. The AVATAR. Go to your FF7 base folder in FF7/data/Menu and then doubleclick on your menu_us-lgp file. Back up your original lgp-file. Then add the new Avatar picture file, .png file-format. Do the same process as before and create your new menu_us.lgp-file. Wolla, now you have Scarlet as an avatar. 3. The battle model. Go to your FF7/data/battle folder. Repeat the same process as before by adding the battle model-files to the newly created battle-folder, repack the folder into an lgp-file and make sure it is named battle.lgp, make a backup of the original file as before before doing this. 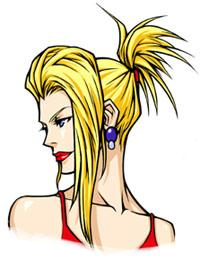 Start the game and Aerith has been replaced by Scarlet of the Shinra in battle. If you do all these steps you will have a fully working Scarlet-mod. But i have still to make the battle-model better. Evil Aerith - Scarlet npc model replaced with Aerith flower model. Feel FREE to make the model better and do whatever you want with it. I would be happy though if you tried to have the original look if going to change it, and don't forget crediting me :P.